Common cold is not a serious health issue, but it can make you very uncomfortable and really ill. It is caused due to various reasons like change of seasons, infection caused by some bacteria, getting wet in the rain and so on. Winter can also cause common cold. Often it is accompanied with headache, fever, sore throat, cough, stuffy nose, lethargy, body pain and bland taste in mouth. 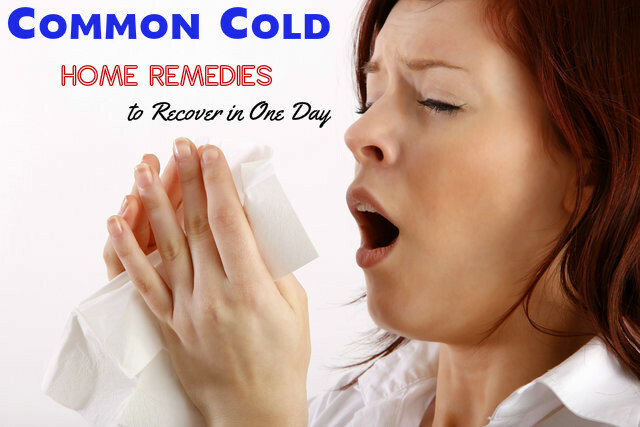 In most cases common cold does not stay for very long. You will get relief within a few days. The good news about common cold is that you can treat it overnight. Surprised? Read on and you will know. Have cayenne pepper with honey and fresh ginger. Mix them in warm water a take a sip a few times a day. This helps in clearing the blocked nose and soothing our sore throat. Gargling warm water to which a little amount of cayenne pepper powder is added is good for treating sore throat. Drinking hot beverages is one of the best ways to get relief from various symptoms of common cold like running nose, fatigue and sore throat. You can drink hot tea. Herbal tea is also god for treating common cold. Non-caffeinated drinks are perfect for treating common cold. Essential oils are also good for providing you relief from the symptoms of cold. Among these oils, lavender, peppermint and eucalyptus essential oils are the best for treating common cold. Sore throat is very common with common cold. To get relief from sore throat, you can gargle with hot water, to which some salt is added. You will get instant relief. Try to gargle with hot water twice a day to get positive results. You may have garlic in many ways. You can chew raw garlic or crush it and add it to soups and broth. You may also mix crushed garlic with honey and have it. Another way to have it is to gulp down garlic capsules with water. Greek yogurt is good for providing you relief from common cold. This is because it contains probiotics or healthy bacteria that can boost your immune system. Try to have unflavoured Greek yogurt. Adding some honey to it can enhance its cold-fighting abilities. The aroma of ginger is great for soothing your nose. Ginger is also known for its anti-inflammatory properties. Ginger helps in clearing the congestion in the nasal cavity. Make tea with ginger and drink it. You can also add ginger to hot soups and stews. The medicinal and anti-inflammatory properties of ginger and cloves have made them ideal for treating common cold. A paste with ginger cloves is good for treating cold symptoms. Have half a teaspoon of this paste twice a day. If you want to try something other than hot tea, you may have hot soup, broth and stew. These are as effective as hot tea. Try to have homemade vegetable soup and chicken soups. Chicken soup is found to be an effective home remedy for treating common cold. This is because chicken soup is said to reduce the generation of white blood cells that can aggravate the symptoms of cold. The fumes from the soup help in making the mucus thinner allow it to flow out of your nose. The nutrients in the soup can provide the energy required. Steam bath is very effective for getting relief from body fatigue and to de-congest the cold. All you have to do is to fill your bath tub with warm water soak your body in it for about 20 minutes. Instead of soaking your whole body, you may also soak your legs in a bucket containing arm water. Honey has healing and antiviral properties, which make it very beneficial for treating cold and for soothing sore throat. The antioxidants in honey help in fighting the virus and bacteria that cause common cold. To get the maximum benefits, take raw or organic honey twice a day. You can also mix one teaspoon of honey with a glass of arm water and have it before you go to bed. It is a good substitute for sugar in herbal teas. Make homemade nasal drop by boiling 8 ounces of water and adding ¼ teaspoon of salt to it. Using this solution as nasal drop and spay it into your nose about 6 times a day. It helps in toning the mucus and removing it from the nose. If you do not feel like having a shower, especially in winter, then steaming can help you get relief from the symptoms of cold. Take a big bowl with water and heat it. Place the bowl on a table, lean over it, and let the steam enter your nostrils. This helps in loosening the mucus. You can wrap a towel around your head to prevent steam from going out. Steam inhalation is great for clearing the blocked nose, so that you can breathe better. You may also add a few drops on eucalyptus oil to the hot water. Turmeric is a common ingredient is found in every kitchen. It contains curcumin, which has lots of health benefits. It is also known for its antibacterial properties. The anti-inflammatory properties of curcumin help in providing you relief from chest congestion and clearing the nasal passage. Boling turmeric with water and inhaling the steam is also good for clearing the nose. Another way to have it is to add it to a glass of warm milk and drink it. Mixing some honey to the milk helps in enhancing its effects. Elderberry is herb and it has been for ages to teat common cold and flu. It contains bioflavonoid and has anti-inflammatory properties as well. Getting proper rest ad drinking lots of fluids is also good for treating common cold.